When I first heard that a new Two Fires album was going to be released I was ecstatic, then when I heard that Josh Ramos was not playing on the album I was a little disappointed, but still knew it was going to be a good album. After all any album with Kevin Chalfont is going to be good. The mans voice is just out of this world, but in my eyes Two Fires without Josh Ramos is not Two Fires but One Fire. The last Two Fires album “Ignition” is one of my all time favorites. Even though it suffered from some crappy production, the songs were just top notch, as were Josh’s guitar playing and Kevin’s sensational vocals. When “Burning Bright” arrived at my house I just couldn’t wait to throw it in my cd player and have a listen. Upon my first listen, I realized that something was missing and that something was indeed Josh’s guitar. While Michael Gardner does an excellent job, he just isn’t Josh Ramos. After the first listen I was able to listen with no preconceptions, and it is indeed a really good record. 1. Is it Any Wonder– A great rockin’ opener just like an opening track should be. 2.- Lost In The Song– Ups the ante a bit, just like the second song should. A great song and one we can all relate to. 3. Some Things Are Better Left Unsaid– This song was co-written with Neal Schon and Greg Rolie during Kevin’s brief stint touring with Journey before the Steve Perry Trail By Fire reunion. A nice ballad, can definitely picture on it on Trial By Fire. 4. Epic In The Night– One of my personal favorites, a moody hard rocker about getting through through tough times. 5. 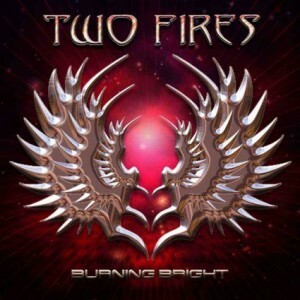 Burning Bright– The title track is picture perfect AOR at it’s best. 6.- Relentless– My other favorite from the track. Great guitar riff!! All in all “Burning Bright” is a great album and Kevin’s vocals are just as perfect as ever. Song wise it is just as good if not better than both “Two Fires” and “Ignition”, however the absence of Josh Ramos is definitely felt.